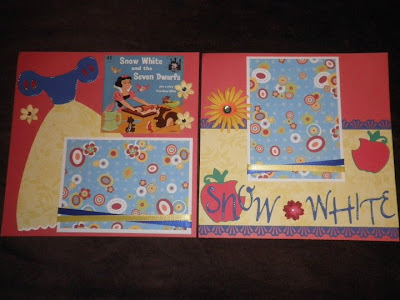 Here is the next layout for my Vintage Disney scrapbook. Snow White!! I love how this set turned out. Snow whites dress and apples are from Disney Princess - Happily Ever After. The font is from Don Juan. I used my white pen to add dots to her dress, the lettering and I also added white ruffles at the bottom of her dress. Very cute! I want that cart and the letter are cool, I don't have don juan either. Great layout! I love the dress - but I especially like the apples with the bites out of them. That's perfect! !